New pedal offers up Eighties-style distortion. 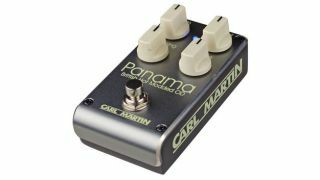 Carl Martin has introduced the Panama Overdrive, a new pedal that offers up classic Eighties-style distortion tones. The Panama boasts Gain, Level and Tone controls, as well as a fourth knob for Damping—turn that control up for more aggressive and cutting EVH-type sounds, or down for deeper, thicker distortion. Other features include Carl Martin DC/DC converter circuitry, head mounted input/outputs and 9V DC input. The Panama is available for $199. For more information head to CarlMartin.com.